LED lighting is a significant energy saver in industrial environments. Above all, it helps to improve workplace safety and comfort. Read the story of Suosiola power plant. Electrical Automation Manager Henri Jokkala sits by his work desk and browses through the energy savings reports of a ten-storey boiler room. The boiler room is part of Suosiola power plant, a significant Finnish heat and electricity producer located in Rovaniemi, far up north. Reports show that compared to previous lighting, the new LED lighting of the boiler room saves 13 000 kWh of electrical energy per month. The savings are big and quickly bring back the money invested in the new lighting. Along with new luminaires, the boiler room now has presence sensors managed via the lighting control system OSRAM ENCELIUM™. With the help of lighting control, the power plant maximises their energy savings and elongates the lifespan of the luminaires. But it’s not just about the savings. The power plant being in a very centred location, the appearance of the plant greatly affects its exterior and the appeal of the whole area. Renewing the lighting of the boiler room is just a chapter in a longer story. The next phases have included another boiler room, area lighting and a sampling station. Eventually, the plan is to have the entire power plant area illuminated with LED technology. At Suosiola, workplace safety is an important matter. The quality of the lighting was recognized as one of the major factors affecting the safety and comfort of the employees. Measurements further revealed great variation in the lighting levels of different areas. With the old lighting, the light levels of the boiler room varied between 5 to 163 lux, creating a safety risk. With the new LED lighting provided by Greenled, the light levels are now significantly higher and even. The lighting quality now reaches the EU standards and more importantly, creates a workplace with improved safety and comfort. Suosiola power plant now has light in places they need it the most. Significantly higher, even light levels improve workplace safety and comfort. With all its engine rooms, working stations, spots and corners the power plant is a complex entity of demanding industrial conditions. In such environments, there’s always dust, dirt and an ongoing production. Proper lighting design and well-planned installation thus become just as important as choosing the right luminaires. The whole lighting renewal was provided as a turnkey solution by Greenled, including planning, delivery, installation and commissioning. 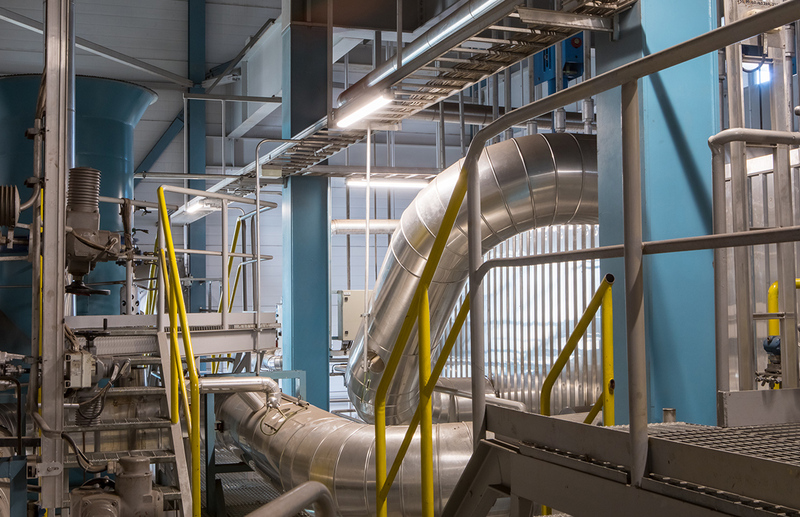 With a short payback period, the power plant got a modern, sustainable lighting solution designed to fit the facilities. Most importantly, they now have light where they need it the most.